The seventh Political Economy Conference, organised jointly by Warwick, Princeton and Utah, took place on 12-13 May in Venice. It has become an established academic event where the top Political Economy researchers in the profession from the US and Europe meet every year during the Spring at the Warwick in Venice stunning venue - the fifteenth century Palazzo Pesaro Papafava. This year the conference featured 10 seminar talks on both theoretical and empirical political economy spread over two days, given by new promising assistant professors as well as by very established scholars, such as John Londregan (Princeton University), Dana Foarta (Stanford University), Gabriel Lopez-Moctezuma (Caltech), among many others. More than 60 faculty discussed political economy from over 20 universities around the world, including several emerging PhD students and Postdocs from Warwick and other universities who exchanged their research ideas with the more senior researchers. The amazing appeal and location of the Palazzo in downtown Venice as well as the Venetian May weather made the academic exchange all the more enjoyable. The highlight of the conference was dinner at Trattoria La Madonna - a very typical venetian tavern. View photos taken at the event here. Professor Simon Johnson, former International Monetary Fund chief economist and the Ronald A Kurtz Professor of Enterpreneurship at the MIT Sloan School of Management, gave the CAGE inaugural policy lecture in Economics entitled “Innovation, Growth and Cryptocurrencies: What Next”? in London on 17th May 2018. In a very informative lecture he discussed the relationship between public investment, science, and economic growth since 1940, exploring the reasons that growth no longer provides good opportunities for many people. Turning to the future, he considered how the arrival of cryptocurrencies might affect inequality and access to opportunity in the future. There was a very diverse audience including A level students, PhDs, policy makers and journalists. The talk was followed by a question session and then a networking reception in the marble room of the venue at the Institution of Mechanical Engineers. One of our PhD students Andy Ferrara has written two informative pieces of work highlighting some benefits of attending conferences. The first is getting the most out of the conferences based on his own experiences and the second piece highlights valuable travel tips for conferences, including advice on visa applications especially for those interested in visiting the U.S.
As there has been a fair amount of media attention recently pointing out to what the BBC News has reported as university racism ‘complacency’, we would like to draw your attention to Warwick policies in this area: Equality, Diversity & Inclusion and Dignity at Work. Warwick is committed to achieving fair and equal representation for all, allowing everyone in our community to contribute and reach their full potential. We aim to ensure a working and learning environment in which all University members (staff and students) are treated fairly and with dignity and respect, and where bullying and harassment are not tolerated. For more information on the subject, including sources of support available to staff and students please visit the following pages: Equality, Diversity and Inclusion and Dignity at Work. The University’s GDPR team has produced some ‘Golden rules’ to help staff correctly handle personal data in their day to day work. Within the Department we are working to produce clear procedures to support staff around the personal data we hold, why we hold it, and how it is used. Please contact Sarah Duggan - S dot Duggan at warwick dot ac dot uk with any queries. 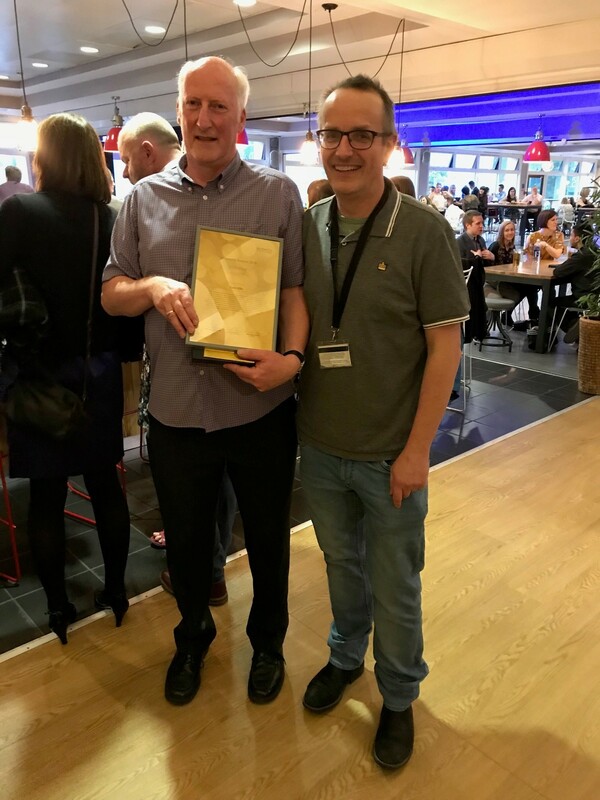 Congratulations to Colin Ellis, who received the Unsung Hero Award at the University Awards Evening at the Butterworth Hall on Friday 18 May. 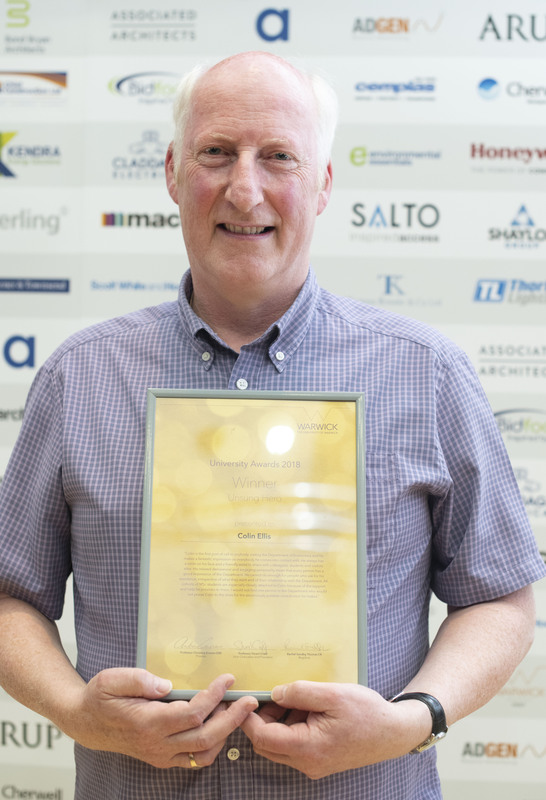 Find out what was said about Colin on the University Awards winners 2018 webpage. 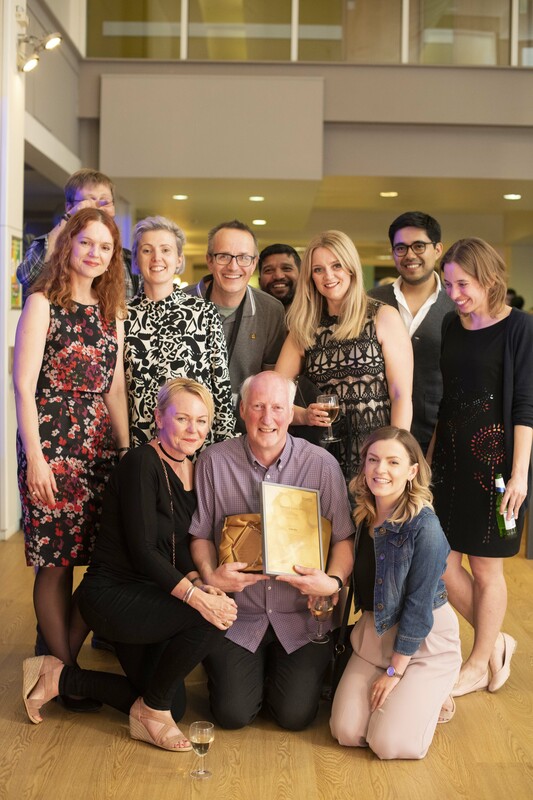 Commented on his award, Colin has this to say: "Well, what an honour, thank you to the people that nominated me, it was a big surprise. Everybody in the department do a fantastic job and it makes my job much easier. Its got to be good if you get up in the morning and you don't mind coming to work, Economics is a great place to work!" Here are a few photos of Colin on the day: Colin-with-HoD, Colin-holding-award, Colin-with-staff. Estates have been in touch regarding the building works which are due to take place this summer, beginning 11th June. They have asked that the bikes that are locked up outside the corridor are removed well before they start. Bikes will need to be moved by 1st June and any that are left will be removed by Security. The contractor will be providing some bike storage in the courtyard on the law school side. The first task the contractor will want to undertake is the removal of the bike storage and pergola. Sascha O. Becker presented "Forced Migration and Human Capital: Evidence from Post-WWII Population Transfers" (joint work with Irena Grosfeld, Pauline A. Grosjean, Nico Voigtländer and Ekaterina Zhuravskaya) at Brown University on Sunday 6 May. Jonathan Cave participated in a workshop in Brussels on: “Multistakeholder participation in global Internet standard setting” which discusses the final outcome of a project involving people from the Turing Institute and the Universities of Warwick and Salford on 23 May. He will also be speaking on algorithmic transparency and running workshop on regional development and 5G, Iot/CPS and Big Data at EuroDIG (the European dialogue on Internet Governance) in Tbilisi, Georgia on 4-5 June. Dennis Novy gave a seminar at the Scottish Government in Edinburgh on trade costs and new research on the inflation effects of the sterling depreciation in the wake of the Brexit referendum on 10 May 2018. Daniel Sgroi has been awarded a research fellowship at the IZA Institute of Labor Economics. Andrew Oswald gave a keynote talk on "Modern Research on Happiness and Mental Health"to the Open University Psychological Society annual conference on May 12th 2018. "Trump boycott of Chinese scientists compromises world science" - Carlo Schwarz mentioned by the author - europa press, 11th May 2018 (This article is in Spanish). "UNECA for Africa: AfCFTA a milestone in Africa's journey towards prosperity.." - Herakles Polemarchakis quoted by the author - 4-traders.com, 14th May 2018. "Hate Crimes Spiked After Trump's Anti-Muslim Tweets, Study Finds" - Carlo Schwarz's research mentioned by author - Daily Beast, 14th May 2018. "Managing emotions in the workplace" - Andrew Oswald's quoted by author - Celpax, 15th May 2018. "Yes, you do get wiser and happier after age 50" - Andrew Oswald mentioned by author - The Washington Post, 15th May 2018. An ‘Emergency First Aid’ course has been booked for Thursday 5 July in S2.77, Cowling Room (Second Floor, Social Sciences building). This course is all day, starting at 9am and ends by 5pm – breaks are arranged during the day. It is beneficial to as many people to know what to do in an emergency situation – in or out of the workplace – if you are interested in attending please let Tina Jones know by emailing fss@warwick.ac.uk or contacting her on 024 761 51732. Names must be confirmed by 15 June so that a confirmed list is sent to the organiser and to enable the course be made available outside the Faculty. The 2018 Women’s Cycle Tour will again pass through campus on Friday 15 June. The cyclists will approach campus from Westwood Heath Road, travel up Gibbet Hill Road and head out on to Kenilworth Road in the morning. If you’re on campus on 15 June, we’d encourage you to support the race by watching as it comes along Gibbet Hill Road in the morning. The Registrar, Rachel Sandby-Thomas and colleagues will be hosting their next professional services coffee morning on Thursday 31 May. This is an informal way to catch-up on institutional developments, as well as network across teams.